After PC, Android devices need extra protection from thieves and hackers attacks, recent reports state that Android attacks anonymously increased in the recent years. Avast launched its latest Mobile Security and Antivirus for Android. The latest version of Avast Mobile Security built with a bunch of very useful utilities. Avast can replace some apps like Applocker, Bandwidth monitor, Anti-Theft, Backup, Privacy Advisor, Application management and SMS and Call filter. The AV test results are very good and protection score is 6.0/6.0. Avast virus scanner can scan your Android’s both Apps and SD card storage. If you want scan only one uncheck the other one. It thoroughly scans my entire phone in 3 min, the time varies when you click on only App scan, it can complete scan in one minute, the remaining time is depending on your SD card size. 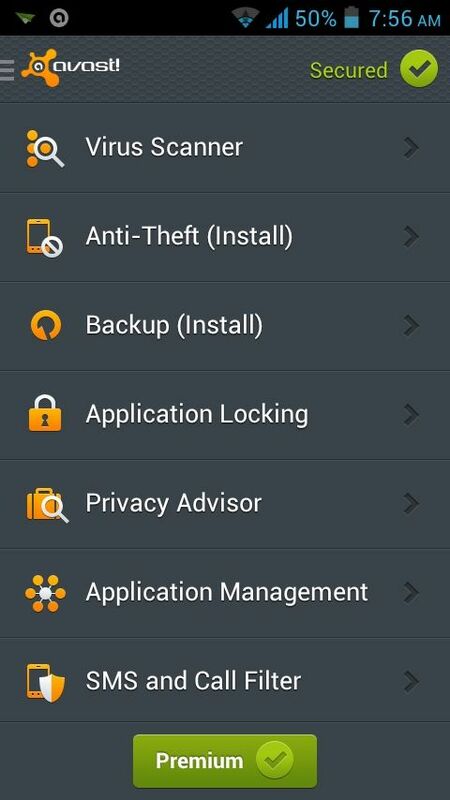 Avast uses File Shield technique, it scans your every file in your Android device. When we lost the device, the biggest threat comes in our mind is data loss. Even we claim the mobile by insurance, but the data we can’t. Avast Anti-Theft feature comes in Avast Mobile Security and Antivirus but you need to install it separately. Anti-Theft feature available in Google Play store, no need to search for the app, you can find directly when you click on the Anti-Theft tab it asks you to download it from play store. The Anti-Theft app will download as an update agent and sizes 6.26MB. After Anti-Theft installation you need to enter your name and alternate mobile number in the app. Next, you can create an account in avast or you can create it later. It offers features such as Lock text, GPS, Wipe, Geofencing, Siren sound, Hard Reset Protection CDMA and Software Updates. Like the Anti-Theft Backup is also need to install it separately. By agreeing to the License agreement you can start and entering your avast account you can start using the avast backup service. Next, avast asks to set backup using your Google Drive account. For the backup you can select Contacts, Calls, SMS, Images, Audio and Video files and all Apps. You can check any of them or all by checking the tick in the box. You can any time can configure and check the backup files from the Main Menu->Backup. If you give most important to privacy, Application Locking is definitely work for you. The main aim of the Application Locking is simple, it just blocks the apps to open. The restricted app is accessible only for the owner of the device. When you click on the Application Locking category it shows the list of all apps in your device. Check the box to stop the app access to others, next time if you want to open app it asks for avast 4 pin pass code. Privacy Advisor show the list of categories which will effect your privacy. In each category, it shows the list of apps which are affecting privacy. For example, in Track Location it shows the apps installed in my device like AirDroid, Angry Birds, Google Play services, Instagram, and Line. Application Management simply does what it says. When you click on Application Management it shows two tabs. One is Running Applications and another is All Applications. When you click on any particular app it displays the App’s system resources. It shows the details like Size, CPU, Memory, Threads and Services of the app. Network Meter displays all the app internet usage by Today, Month and Year wise. Bottom of Application Manager you’ll find Firewall option. Here you can stop the access of internet usage by WiFi. In SMS and Call Filter you can block unwanted SMS and calls. To start using this click on Create a new group, in this you’ll see options Block incoming, Block outgoing, Week, days and Time. You can select unwanted numbers by clicking on group members, to add group you can select numbers from contacts list, from SMS/MMS, from call log, custom number, all hidden numbers and all unknown numbers. The main aim of the Firewall is to block the data activity of apps. You can block any app installed on your device by simply clicking on Enable Firewall options. Avast Firewall shows the list of apps which uses data connection alphabetically. You can block data connection by Wifi and 3G, or you can set individually to every app. Network Meter displays all the data usage of your Android device. You can monitor data usage by using different tabs 3G, WiFi, Roaming and all. Avast Mobile Security and Antivirus can replace lots of apps in your device. Example I am using Call Blocker for blocking unwanted calls, 3g Watch Dog for Data usage analysis, G Cloud for Backup, App Lock for Application Locking and number of Cloud services for Photos and Audio backup. The navigation and usage of the app is very easy, Avast uses powerful techniques to secure your phone from thieves and hackers in a most promising way. It is a must have security app for every Android user. The app is available in both free and premium versions, premium version offers features like perimeter with Geofencing, App Lock to control access to apps, Increase device access security, Detect which apps use ads.